Southampton is the 5th diner that Red Dog Saloon has opened and it's the first one in the south of the country. As I mentioned Red Dog Saloon is an authentic American diner, focusing on barbeque food from the south of America. 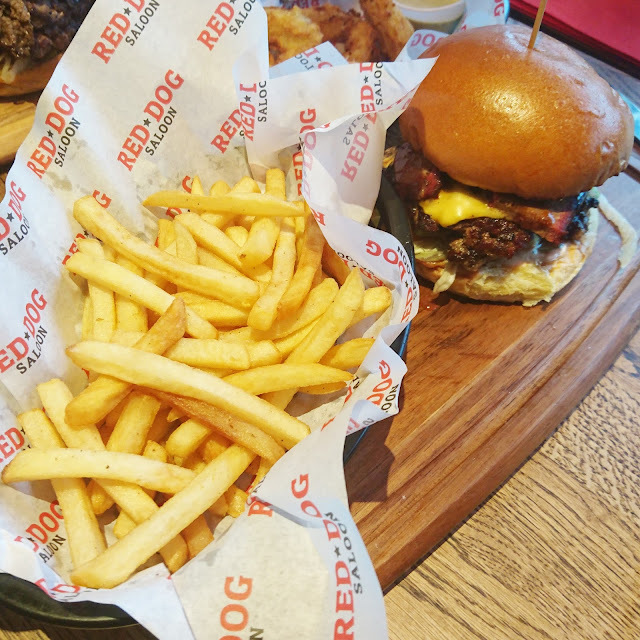 Red Dog Saloon cook their cuts of meat over traditional American Hickory and Mesquite wood for up to 16 hours to give the meat the full smokey barbeque flavour that you would expect from the south. I went on a Sunday afternoon with my friend Mike so we could have as much food as possible. We arrived and were shown to our table quickly and introduce to our waitress for the meal Emily, who gave us time to look into the menu and get confused because we wanted everything. It was hectic at the time we went, but Emily was nice, friendly and made sure that if we did need any assistance, all we needed to do was let her know. After getting a pitcher of Becks Vier to help us choose what we wanted to devour, we settled on a starter of the Wing Sampler of 12 wings where we decided to try the Original Buffalo, Blackened Cajun and Maple and Bacon. You also get to have the option of Bar-B-Q and Spicy Korean. These were the best wings that I have ever had! I'm not even lying with this statement. The Original Buffalo wings were hot and you could really feel the hot sauce as soon as you ate them, the Blackened Cajun wings were probably my favourite of the three wings we tried. They were covered in a mixture of spices and herbs that really mixed well with the chicken, the first bite is a bit grainy but it only takes a few seconds for the full flavour of the spices to hit your taste buds. The Maple and Bacon were my least favourite of the three (These were Mike's favourite) this may be because they weren't spicy but the combination of Maple and Bacon is always a winner. Once we had our demolished our wings and they went quickly, we went straight on to our burgers. The burgers at Red Dog are 100% aged chuck stakes, made on sight, into fresh patties in a wide range of flavours and styles. I went with the signature Philly Cheesestake with Red Dog Sauce, beef tomato, fresh cut onions and pickles and Mike went with The Texan which was a 12 hour Hickory smoked Brisket, Kansas City sauce and American cheese. These were huge, you got two full sized patties with all the extra's in between and the buns were toasted to perfection. The one down side was that if you wanted chips or onion rings you had to pay for these as an extra. We didn't need them in the end because the burgers were filling but the Sweet Potato Fries were amazing. The decor inside had a rustic American bar feel to it. The skulls on the wall, wooden cabin feel and Whiskey in display in the cabinet's by the bar, really helped along with the American experience. I couldn't get enough of the food and it really did blow all expectations I had out of the water. I will be going back and trying the Ribs because everything I tried on Sunday was unreal. Have you tried Red Dog Saloon and the flavours of the south? If so what was the favourite meal? OMG this place looks like meat heaven!!! Definitely going to be heading their son with the boys! !